Federal University Dutsinma, FUDMA Freshers/Newly Admitted Students Acceptance Fee Payment and Admission Clearance/Screening Exercise for 2018/2019 Academic Session. All candidates offered provisional admission into the Federal University Dutsin-Ma UTME and DE various degree programmes for 2018/2019 academic session are hereby informed to proceed with the acceptance of admission, admission clearance and payments of school charges for 2018/2019 academic session. 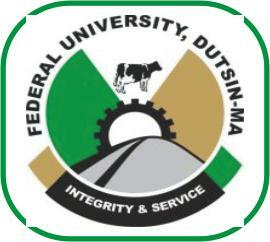 Federal University Dutsin-Ma UTME Admission List for 2018/2019 Session.